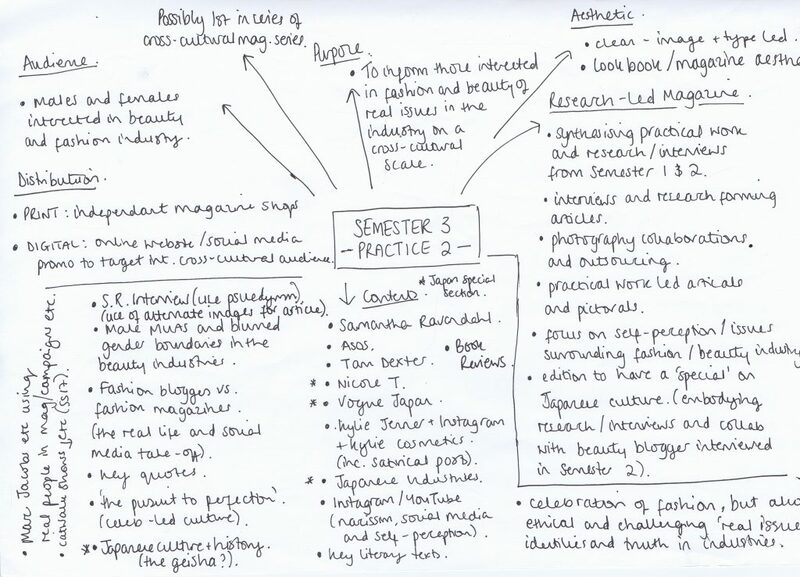 Below shows a mind map which was drawn up whilst reflecting on Semester 2 and Practice 1, in order to move forwards with Practice 2. This formed the basis of my proposal whilst reassuring my objectives which have been carried forward are accounted for. In addition, this allowed for planning to start to take place, noting possible contents sought from previous research and research findings, i.e. interviews/working research trips (both UK and Japan), whilst also using my dissertation as a trigger for specific articles to be added in additionally. This mind map also enabled me to consider briefly whom the audience would be, however I feel the target would mainly be females due to the industries and magazines still being heavily directed that way, whilst in addition, 90% of my research findings show that the vast majority of beauty/fashion bloggers and/or magazine readers/social media users are female. The map also enabled a purpose to be derived, considering aesthetic, tone of voice and purpose.